The shift valves (fig. 4-40) are simple balance- type spool valves that select between low and high gear when the manual valve is in drive. Using control pressure (oil pressure from the regulator, governor, vacuum modulator, and manual valves), they operate the bands, servos, and gearsets. Oil pressure from the other transmission valves acts on each end of the shift valve. In this way, the shift valve is sensitive to engine load (vacuum modulator valve oil pressure), engine speed (governor valve oil pressure), and gearshift position (manual valve oil pressure). These valves move according to the forces and keep the trans- mission shifted into the correct gear ratio for the driving conditions. The kickdown valve causes the transmission to shift into a lower gear during fast acceleration. A rod or cable links the carburetor or fuel injection throttle body to a lever on the transmission. When the operator depresses the throttle, the lever moves the kickdown valve. This action causes hydraulic pressure to over- ride normal shift control pressure and the transmission downshifts. The valve body contains many of the hydraulic valves, such as the pressure regulator, shift valves, manual valve, and others used in an automatic transmission. The valve body bolts to the bottom of the transmission case and is housed in the transmission pan. A filter or screen is attached to the bottom of the valve body. Passages in the valve body route fluid from the pump to the valves and then into the transmission case. Passages in the transmission case carry fluid to other hydraulic components. 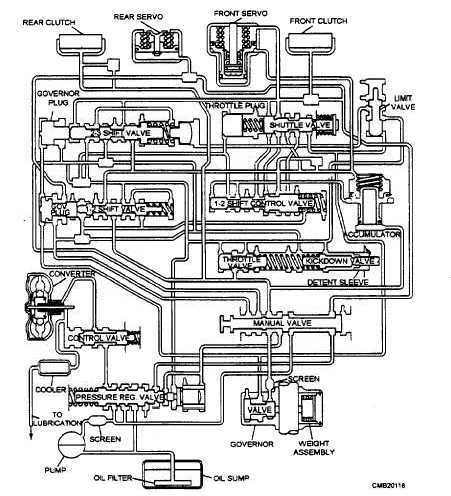 To get an idea of how complicated the hydraulic system really is, a schematic view of an actual hydraulic system for an automatic transmission is shown is figure 4-41. Figure 4-41. - Hydraulic schematic of a typical three-speed automatic transmission.